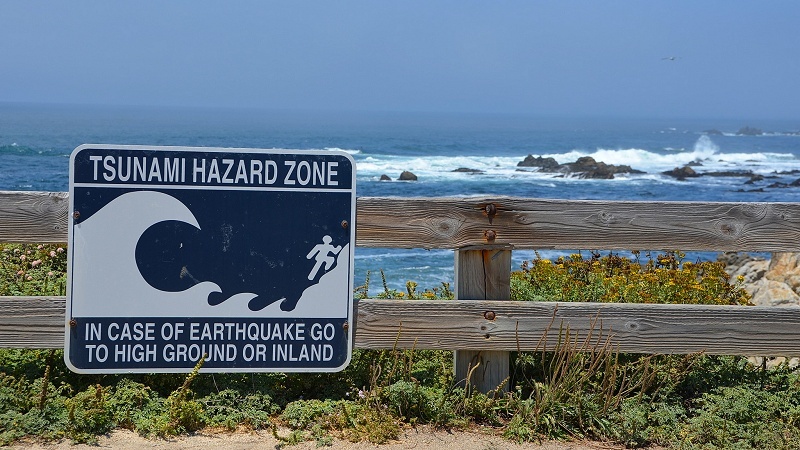 This week, March 22 - 28, is Tsunami Preparedness Week, a concerted national effort to bring together everyonefrom emergency responders to the general publicto prepare for tsunamis, the seismic sea waves which can threaten our Bay Area beaches and coastlines around the world. The great earthquake tsunamis in Sumatra (2004) and Japan (2011) awakened an awareness of tsunamis that had faded in this country since the great Alaska earthquake of 1964. It has been heartening to watch this program spread through internet campaigns and social media. Tsunamis can happen at any time. Watch the sea for sudden changes. If one of these happens, get away from the water and stay away. Follow the signs to shelter. If you feel a long, strong earthquake, do the same. Big quakes, sudden sea changes, sirensone of those three is enough. Don't wait for the others, just get to safe ground. Longtime locals know about tsunamis. So do science geeks like you and me. But we need to maintain, cultivate and spread that knowledge. Bring it up every now and then with neighbors, friends, coworkers and acquaintances. If you have house guests from out of the area, assign them some advance reading. If you're traveling to other shores, assign yourself the same research—and share it with those you meet. This is what people in hurricane country, tornado country and blizzard country do. 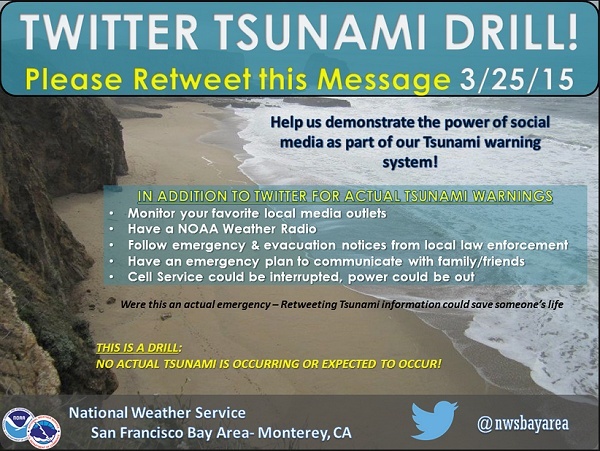 Tsunami alerts on social media are a message multiplier. Wednesday morning at 10:15, this message came up on Twitter. I saw it directly because I'm one of the 15,600-plus followers of the National Weather Service's @NWSBayArea account. I immediately retweeted it to my own 4400-plus followers. What good did that do? It served as a drill for an alert system that could save lives. For instance, if I'd had friends or relatives visiting the beach yesterday, I could have followed up by phoning or texting them—after checking out the alert and making sure I understood it. Maybe they would have missed the tsunami sirens otherwise, or not grasped their meaning. Maybe they would recall seeing the signs on their way to the water. The TsunamiZone is a public home page guided by authorities in the field; beyond presenting the basics it hopes you'll enlist in activities like the TsunamiReady Program for communities. California's central tsunami site www.tsunami.ca.gov is run by the California Geological Survey. It presents inundation maps, specialized information for people like boat owners, and more. The National Weather Service offers a wide choice of Twitter feeds and Facebook pages to suit your preferences. The agency can plug you in to weather bulletins and news as well as tsunami alerts. The U.S. Geological Survey covers tsunamis along with volcanoes, earthquakes, landslides and many other natural hazards. Start on its Natural Hazards home page to explore the scientific side of this field. Finally, the National Weather Service runs the National Tsunami Warning Center for the U.S. and Canada and the Pacific Tsunami Warning Center for the Pacific, Hawaii and the Caribbean. When the news media announce a tsunami message, this is where it comes from.